Whisk dry ingredients in a mixing bowl. Whisk wet ingredients in another mixing bowl. Fold all ingredients until you can form a sticky dough. Divide the dough to 12 ball. Place on the baking tray with at least 1-inch apart. Spray some water on top of the ball and place in the oven for about 20 minutes until the bread is crusty outside, but soft and dry inside. Remove from the oven, cool and serve fresh. Cook the chicken for 3 minutes. Throw in spring onions & mushrooms. Add heaped tbsp flour & stir. Add 2 tsp mustard, 1 heaped tbsp crème freche & 300ml chicken stock – stir. Stir in thyme, nutmeg, salt & pepper. Unroll sheet of puff pastry on to floured surface, lightly score it with a knife. Pour chicken filling into baking dish. Brush a beaten egg over the top of the pie. Blend all ingredients and ready to shape and serve. Massage oysters with small amount of Corn Starch and salt. Wash and dry thoroughly. Mix oysters with spring onion, tapioca starch, corn starch, fish sauce and water. Season with pepper. Heat the pan with oil. Pour the mix. Fried until golden brown then turn. Pour on the whisked egg. Fried until golden brown and turn again. Remark: Foil bottom of baking tin with large aluminium foil if use removable base tin. Double foil or seal 2 piece of aluminium foil well to create a large piece of foil if aluminium foil not large enough to avoid the water go in to the tin. Place egg whites in a large clean bowl free of oil and water. Use an electric mixer to beat the egg whites until bubbled, then add half sugar and lemon juice and blend with medium speed by turning the bowl. Pour all sugar in the egg whites when more bubble and blend with high speed until very stiff peaks form. Prepare the cheese batter first. Heat the cream cheese with milk in a pot, stir until well melted, remove from the heat. Add in the butter and sugar while hot, stir until melted. Prepare the egg yolk batter. Mix milk with egg yolk and sugar. Sift in flour and mix well. Mix well egg yolk batter and cheese batter(best temp 40-45C for best texture). Fold in half of meringue into cream cheese mixture gently with a rubber spatula, fold in another half meringue until well mixed. Pour the mixture into baking tin. Knock off large bubble. Place the baking tin on a large baking tray. Add boiled hot water in the tray as much as possible. Bake in preheated oven 180C for 15 minutes to colour. Adjust the heat to 100-120C for about 50 to 60 minutes. Test with a needle or skewer that comes out clean. Remove from the oven and remove from the baking tin. Flip it on a wire rack, tear off the baking paper and cool completely. Brush jam on top as prefer. Chill in a fridge for about 3 hours. Enjoy! Blend garlic and shallots. Add all other ingredients. Marinade the meat at least 2 hours or overnight in the fridge. Skewer the meat onto the bamboo skewers evenly. Cook this over a charcoal grill for best flavor or grill in oven or on a griddle pan. Braise the satay with a stalk of lemongrass with oil create the authentic flavor. 1kg Beef, cut into thin 1 inch strips and then into 1inch long pieces, which makes it easier for skewereing. You can use any of the more tender cuts of meat like feather, rump or sirloin. Don’t use stewing or chuck steak as that will be too tough. Blend lemongrass, shallots, galangal and garlic in a food processor until fine paste. Stir well to combine with other ingredients. Skewer the meat and barbeque or grill until the meat just cooked. Blend shallots, garlic, galangal, rehydrated chillies and lemongrass with food processor and blitz to form a fine paste. Don’t be tempted to add water as this will make the paste difficult to caramelise. You can also use a mortar and pestle but you must add only small amounts of the ingredients at a time, ensuring you have a fine paste before you add more ingredients. Set aside. Heat oil in a saucepan or wok over medium heat, add in paste, fry and stirring until caramelised and fragrant. Add water and bring to boil. Add tamarind, lime, sugar, salt and half the peanuts. Bring to boil again, and simmer until thickened. remove from heat and set aside till required. When you’re ready to serve, re-heat and stir through the remaining peanuts. Heat the pot with oil. Saute minced ginger, garlic and fried shallot until fragrance. Brown the pork minced or diced pork belly. Add diced Shiitake mushroom and stir well. Mix well with light soy sauce, dark soy sauce, cooking wine, star anise, chinese five spice powder, sugar and pepper powder. Add in hot water or stock until minimum 1-2cm top of meat. Add in peeled hard boiled egg, fried shallot and stir well. Simmer 2 hrs with low heat. Seasoning with salt and pepper. 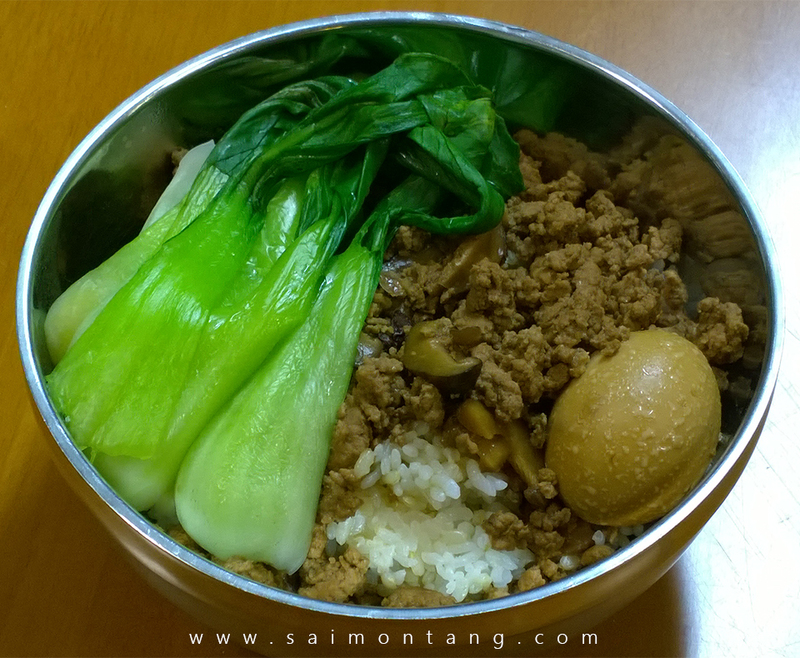 Serve on rice with boiled Chinese green vegetables and braised egg.